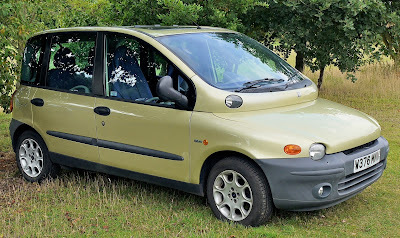 The Fiat Multipla polarised opinions when it was first seen in 1998… and 20 years later it STILL polarises opinions. This weird-looking compact MPV didn’t look like anything else, both on the outside and the inside. When it first came out, people would stare at it… the strangely bulbous design looked rather fish-like and actually distracted from a rather brilliantly practical design. Inside the Multipla featured six seats – three in the front and three in the back. This unusual layout meant that the Multipla was both wider and shorter than the saloon car it was based on… and a lot taller. Oh and a lot more weird looking, obviously. It wasn’t the first car to bear the “Multipla” name, in the 1950s Fiat also produced a six-seat version of the diminutive Fiat 600. That was also a clever use of space, and like its 1990s descendant the original was also a very odd looking vehicle, with the 1950s version looking a bit like a mollusc. And it also looked like it was designed back-to-front. The Multipla was incredibly practical, good to drive and had bags of space in the well-designed and rather funky interior. When launched in 1999 it got plenty of attention, but it sold only moderately well. The rival Opel / Vauxhall Zafira with rather more traditional styling consistently outsold the Multipla in Europe by a ratio of about five to one. 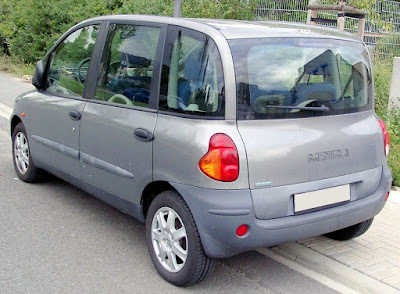 A redesign in 2004 gave the Multipla a more conservative front end, but the rest of the car kept its characteristic design. This lead to something that looked rather unbalanced, however it did result in a slight uptick in sales. Production ceased in 2010. In the UK the Multipla was never a particularly common car, with a peak of 16,000 being on the road in 2007. By late 2017 nearly three-quarters of those cars were no longer on the road, but this relative rarity (especially of the original models) does mean that the remarkable design of twenty years ago does still seem fresh and very radical when you actually see one. Electrical gremlins and a flimsy interior seem to be the main issues to look out for. And the door and window seals. And indeed a whole bunch of other mechanical issues, but the chances are if you love the car you won’t care. Prices for the original more funky model start at little over £1000. The Mutlipla adapts well to taking a wheelchair as well, so these are usually available. Although the Multipla was a remarkable car which created a buzz, it was not the sales success that Fiat desperately needed. In 2007 though Fiat again resurrected an old nameplate, but this time the Fiat 500 was an enormous success which really did turn around the company’s fortunes.